OLED Lighting has struggled to gain relevance as it competes with the LED juggernaut. Even as the LED industry struggles with over supply and low margins, it continues to grow in the solid state lighting market partially because the LED performance specs are unmatched, when it comes to lm/W, lm/$k and lifetime. But are the published specs accurate and do they represent the entire spectrum of performance. 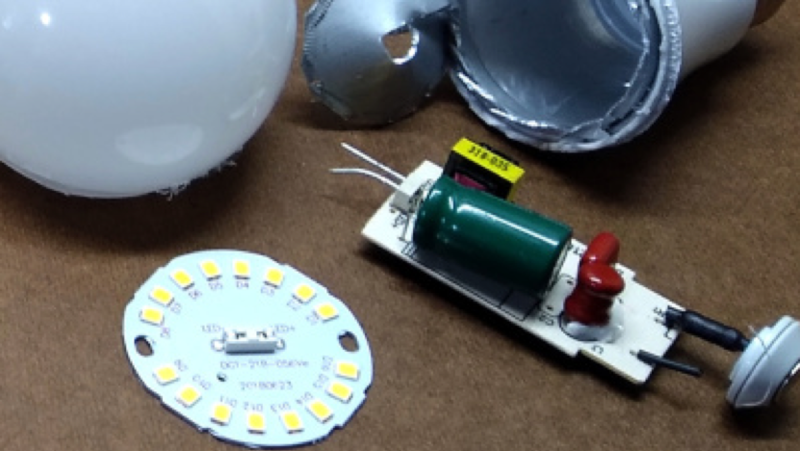 HACKADAY published an article by Ted Yapo that challenged the lifetime claims of LEDs. How can the lifetime be 100,000 hrs, if the packaging on an LED bulb from a major brand is only 7,500 hrs? Moreover what is lifetime? LED lighting has been hyped as providing 50,000 hour or even 100,000-hour lifetime ratings, but in a recent trip to the hardware store, the longest advertised lifetime was 25,000 hours. Others claimed only 7,500 or 15,000 hours, including brand-name bulbs from Cree and GE. ​A 1,000-hour lifetime for an incandescent bulb typically has a figure of merit of B50 meaning that it was the time it took 50% of the bulbs to fail. What “failure” means depends on the type of bulb. The definition of B50 reveals a common misinterpretation, namely that a bulb will last for its rated lifetime. In reality, only half of them last that long, although this rating doesn’t say anything about the distribution of failures around the median lifetime. Manufacturers use these ARL values to forecast how many years a bulb will last based on using the bulb a specified number of hours per day (typically 3). LED bulbs suffer less wear-out through power cycling than incandescent, so the conversion is just a division: years of service = ARL/(3*365). For example, half of a set of 100,000-hour bulbs would still be in service after 91 years according to this calculation. But this simple metric doesn’t tell the whole story. LED bulb failure mechanisms are complex and fundamentally different from the well known incandescent. LEDs need clean, constant-current DC sources; so circuits inside the bulbs must rectify and filter the incoming AC, then limit current to the LED packages. Three different A19 style bulbs were dissected one each from the GE “Basic” and “Classic” lines (7,500 and 15,000 hours), and a Cree model offering a 25,000-hour life. GE Basic A19 Bulb (7,500 Hours Advertised): Uses a circuit straight from the SM2082D datasheet. This GE bulb has a plastic dome covering a circular aluminum PCB, which carries eight LED packages and the driver electronics. The driver consists of an MB10F bridge rectifier, an electrolytic capacitor rated for 105 °C, and an SM2082D linear constant-current driver. There are three resistors on the PCB: one bleeds charge from the capacitor when the bulb is off, and two others set the SM2082D current to 54 mA. In fact, the circuit looks like it was taken directly from the SM2082D datasheet. Seven of the 3.5 x 2.8 mm LED packages show around 18 V of forward drop when driven with 50 mA, indicating that they contain six LED dice in series. One LED on the board shows a drop of 9 V, so it has only three LED chips. All the LEDs, totaling 45 dice, are wired in series to drop approximately 135V. ​GE Classic A19 Bulb (15,000 Hours Advertised): This bulb is in a glass envelope just likes incandescent, and like those old bulbs, the glass is easily removed with a ball-peen hammer. In place of the tungsten filament is an aluminum PCB folded into a squat obelisk. Sixteen 3.5 x 2.8 mm LED packages are connected in series on the board, with each one showing a forward voltage of around 9 V at 50 mA. So, this version has 48 LED chips vs. 45 for the Basic bulb, except they’re in twice as many packages – this is good for keeping the LEDs cool. Another difference with this longer-lived bulb is that the driver electronics are not thermally coupled to the LEDs; they are hidden on a separate PCB in the screw base. This keeps the rest of the components from heating with the LEDs. On the driver PCB is a bridge rectifier, an electrolytic capacitor again rated for 105°C, and an SOIC-8 IC. Interestingly, this bulb also contains a metal-oxide varistor for transient suppression. Although I couldn’t determine what the house-marked (“BYSACT”) driver IC was, the lack of any inductive components on the PCB indicates this is another linear supply. ​Cree A19 Bulb (25,000 Hours Advertised):The Cree bulb has a diffused plastic dome like the GE Basic model. Inside, a larger aluminum PCB holds (16) 3.5 x 2.8 mm LED packages. Each LED drops around 8.5 V at 50 mA, so they contain 3 chips; like the GE Classic bulb, this one uses 48 total LED dice. The LEDs are wired as eight sections of two paralleled LEDs, so the total drop is around 68 V. The LED PCB is coupled to a thick aluminum heat sink with silicone thermal compound. LEDS “OUTLAST” OTHER COMPONENTS; It’s not much to go on, but what conclusions can be drawn from the design of these three bulbs? It helps to consider how they typically fail, and what factors affect their lifetime. The LED bulbs contain a number of parts, so which ones might be responsible for failures. The US Department of Energy (DoE)’s solid-state lighting program’s Lifetime and Reliability Fact Sheetcontains data on the failure rate of 5,400 outdoor lamps over 34 million hours of operation. 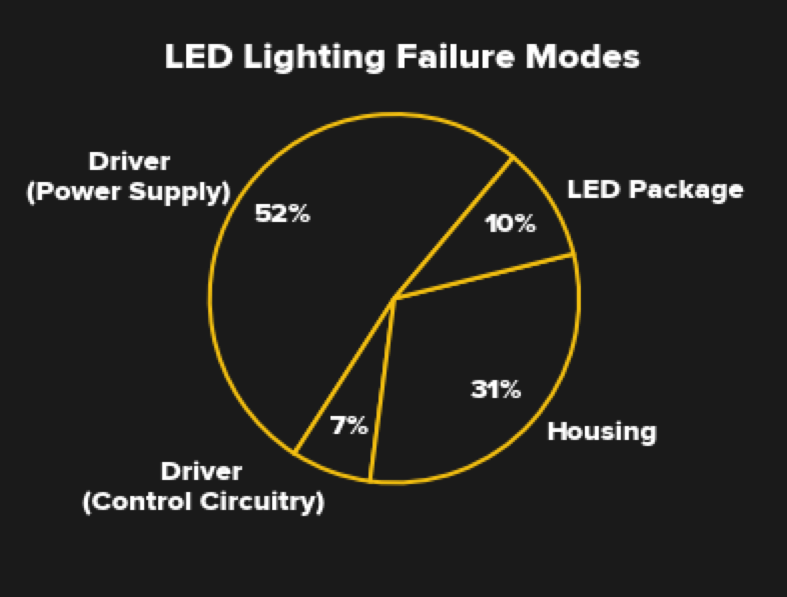 Interestingly, the LEDs themselves account for only 10% of the failures; driver circuitry, on the other hand, was responsible almost 60% of the time. The remaining failures were due to housing problems, which may not be as applicable for bulbs in indoor use. This data shows that at least for catastrophic failures (where the lamp ceases to emit light), extending lifetime means improving the power supplies. Among the components found inside the bulbs, two stand out as life-limiters: the semiconductors and the electrolytic capacitors. Both of these components suffer from a failure rate that is a strong function of temperature. The typical model for this effect, based on the Arrhenius equation, predicts a doubling of lifetime for each 10 degree Celsius decrease in temperature, at least over a limited range. The two longer-lived bulbs use twice as many packages to carry approximately the same number of LED dice as the GE Basic lamp, decreasing thermal resistance to their respective heat sinks, and presumably reducing their temperature. These bulbs also both mount the failure-prone driver electronics on separate PCBs from the LEDs to keep them cool. Finally, the 25,000-hour Cree bulb uses an electrolytic capacitor rated for 130 °C as opposed to the 105 °C caps in the other two. For similar operating temperatures, this could multiply the expected life of the capacitor by a factor of five. Each of these measures probably contributes to delaying catastrophic failure of the bulb, resulting in the longer rated lifetimes. But when it comes to the LEDs themselves, there is more to lifetime estimates than predicting catastrophic failure. Incandescent lamp failures are immediate, one second it’s burning bright; the next, it’s not (and every once-in-a-while, you hear a pop followed by a faint jingling as the liberated filament ricochets inside the bulb). Power supplies aside, LEDs gradually lose brightness as they age. In the lighting industry, this is known as lumen depreciation, and is a separate failure mode from the catastrophic failure we usually think about. As it turns out, lumen depreciation happens to incandescent bulbs, too. By the end of their 1,000-hour life, the output has typically dropped 10-15%, but it is virtually unnoticeable. With LEDs, the output continues to fall as the device ages. At some point, the LED is no longer producing enough light to fulfill its original purpose, even though it hasn’t “burned out.” Research says that most users won’t notice a gradual 30% drop in light levels; accordingly the industry uses L70, the time at which the output has dropped to 70% of its initial level, as an endpoint for measuring LED bulb lifetime. Based on how it’s estimated, this measure is typically stated as B50-L70, the point at which 50% of an initial sample of bulbs will retain 70% of their rated output. Phosphor-based white LEDs also change color as they age. The US DoE’s report on LED Luminaire Reliability: Impact of Color Shiftdefines four color-shifts (blue, yellow, red, and green) observed in LED lamps, although the yellow shift dominates in high-power white LEDs. This gradual yellowing of the light output results from phosphor cracking, delamination, and thermal effects, since the phosphor temperature can exceed that of the LED junction by 30 C – 50 °C. Modeling and predicting color shift in LEDs is a difficult task, with all of the mechanisms not yet fully understood. As a result, no standards have yet been established for accelerated testing or projection of color stability over time. There is more to LED bulbs than lifetime such as color temperature and color rendering index (CRI). There are also a number of larger problems involved, including issues of economics and sustainability. Some of these are addressed in J.B. MacKinnon’s 2016 article, The L.E.D. Quandary: Why There’s No Such Thing as “Built to Last”, in The New Yorker. Certainly moving away from incandescent bulbs to more efficient lighting makes sense, but maybe we never really needed 100,000-hour bulbs in the first place. The lifetime of even 7,500-hour bulbs is long compared to the rapid pace of advance in lighting technology. Does it make sense to pay for expensive long-lived bulbs today, when better, cheaper, more efficient ones may be available in the near future? The oldest surviving incandescent light, known as the Centennial Bulb is a dim carbon-filament bulb that’s been burning nearly continuously since 1901 — over 1 million hours. In its current state, it throws off as much light as a modern 4-watt incandescent. Would it have made sense to pay a premium for such “million hour bulbs” at the turn of the 20th century if we had any inkling of the advances that would come in the next 117 years?